The types of mental “algebra” problems your child will learn from this lesson are focused on solving the typical type of “so-and-so has twice as many apples as his friend, if together they have such-many apples, how many does each person have?” problems. Where can you get this NEW algebra worksheet? Head over to TeachersPayTeachers and you can pick this lesson up for a song! Why did I write this math curriculum? Why is this second worksheet in the series unique? 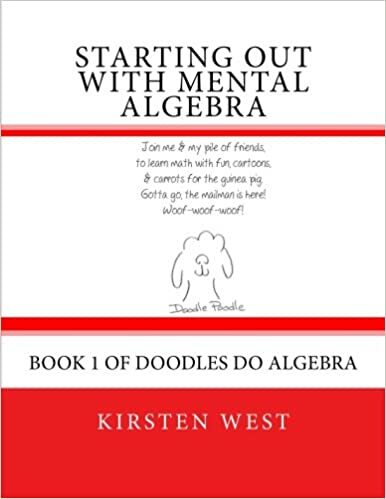 The Doodles Do Algebra(TM) series of lessons is designed for minimal teacher involvement. You can pick up all the books in paperback on Amazon, or purchase individual lessons from TeachersPayTeachers. Most everything the child needs to learn comes from the Doodle cartoon that explains the lesson of the day. I used this entire series to teach my own children Algebra I and Algebra II, but individual worksheets are wonderful for reinforcing concepts you are teaching with an alternate curricula. As a side note, my kids like to color in the Doodle Cartoon character each day and give them hats and crazy facial expressions. It is a fantastic way to etch the algebra concept of the day into their memory.